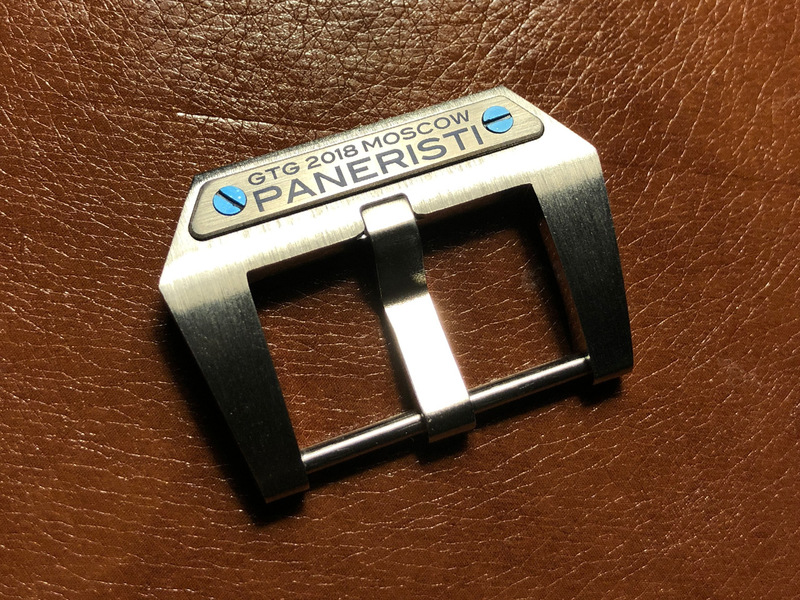 When the Russian Paneristis announced their first international Moscow GTG, I got very excited. Moscow has always been on my list of destinations I wanted to visit and this event was the perfect opportunity for another great journey. 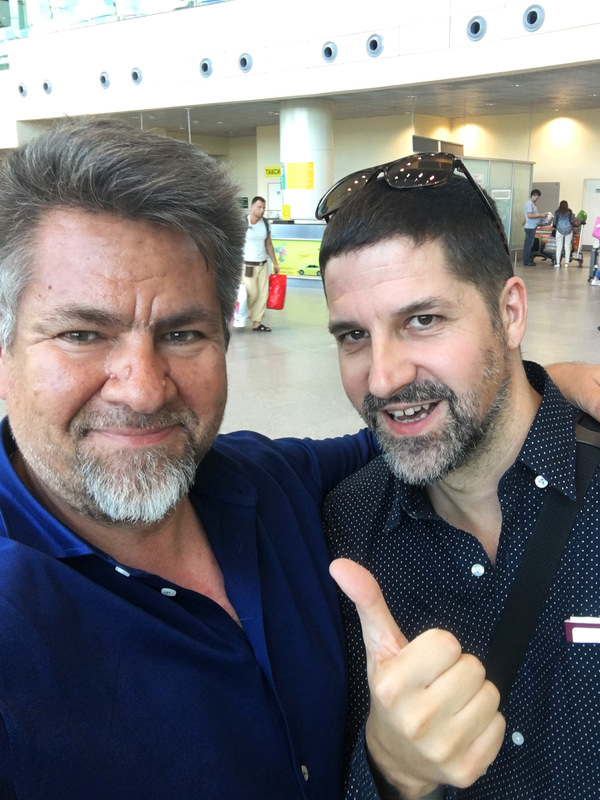 After my recent trip to Florence, I spent a few days with my family in Barcelona before heading to Moscow to the first international Moscow GTG. 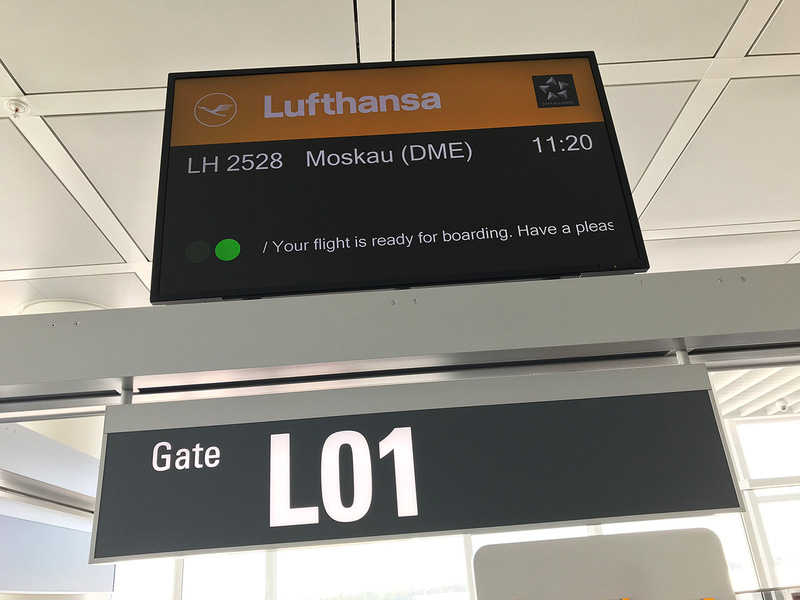 Off to Moscow with a short layover in Munich, Germany. The large open space in the picture below is the Theresienwiese, the place where the famous Octoberfest beer festival takes place. 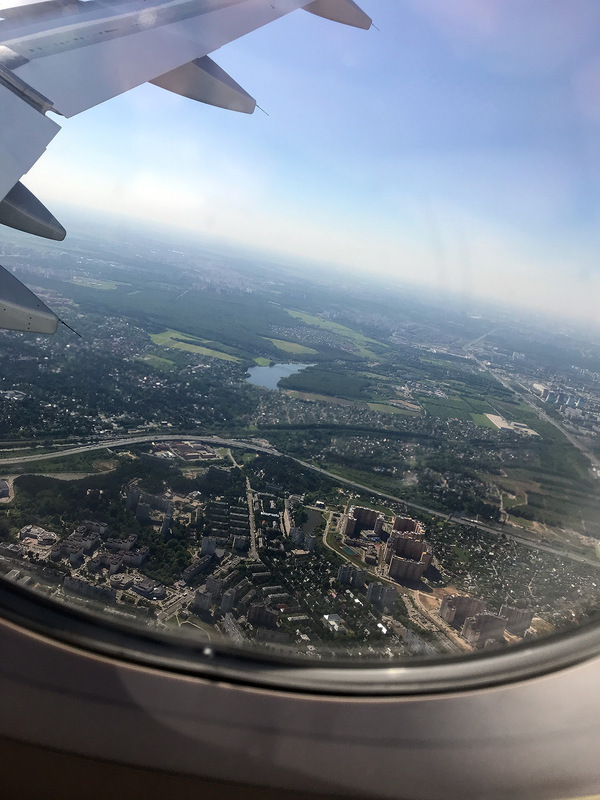 Final approach on Domodedovo International Airport, Moscow. The power plant on the far right is one of the many thermal power plants around the city. This one belongs to Mosenergo, the largest thermal power generating company in the world. Mosenergo is a subsidiary of Gazprom. Welcome commitee at the airport. My dear friend Anton was very kind and came to pick me up. 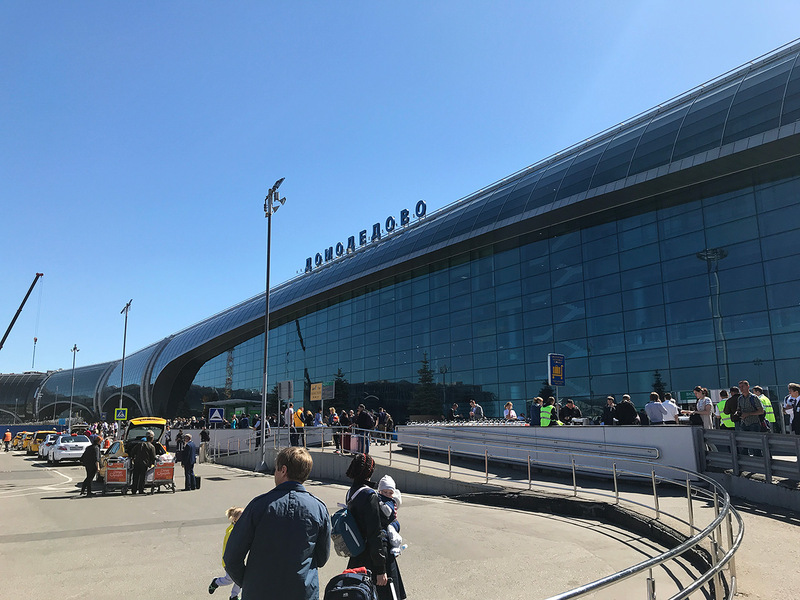 Domodedovo International Airport from outside. 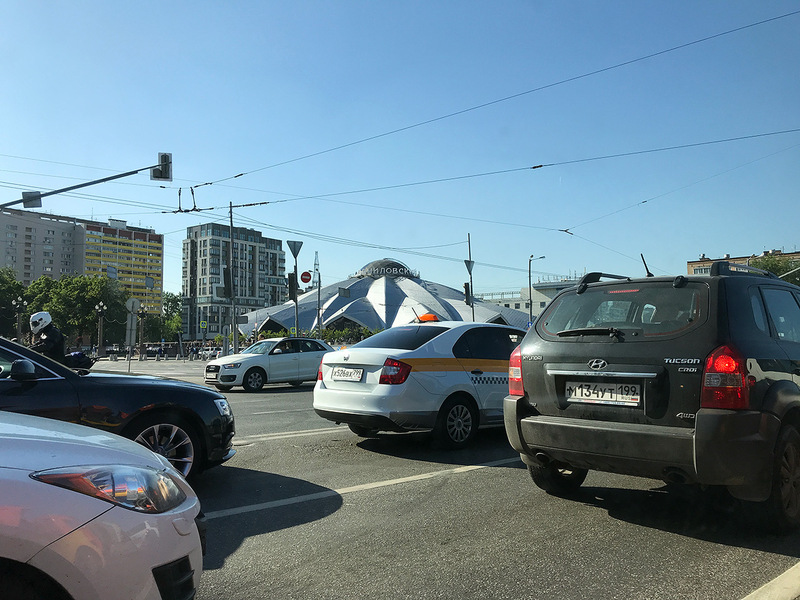 An UFO in the middle of Moscow? Nah, it’s just the famous Danilovsky Market. The former Soviet-era farmer’s market has now become a food heaven. 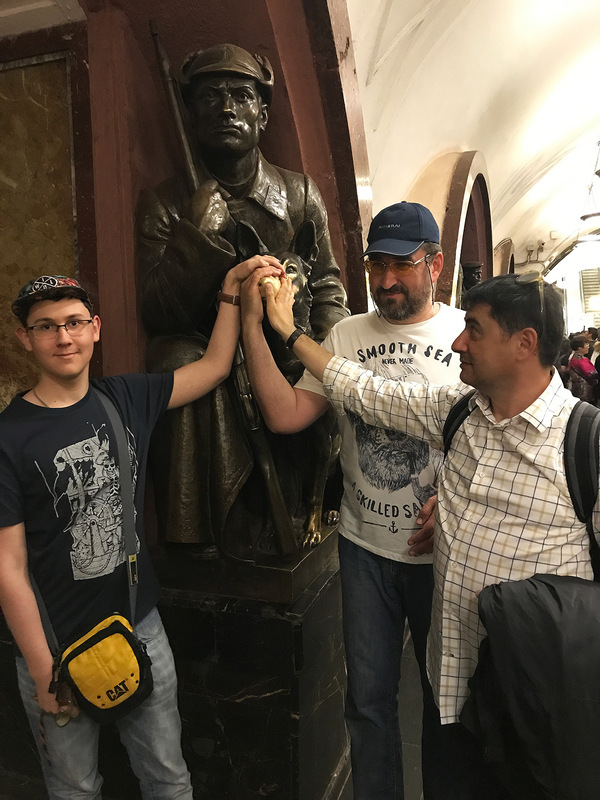 After checking-in to the hotel, Anton and I took the Moscow metro to get to the venue where the GTG would take place. МАЯКОВСКАЯ = Mayakovskaya. Long way down to the center platform. The station is 33 meters (108 feet) below the surface. When we walked into the center platform I was immediately in awe! This looks more like a cathedral than a metro station. 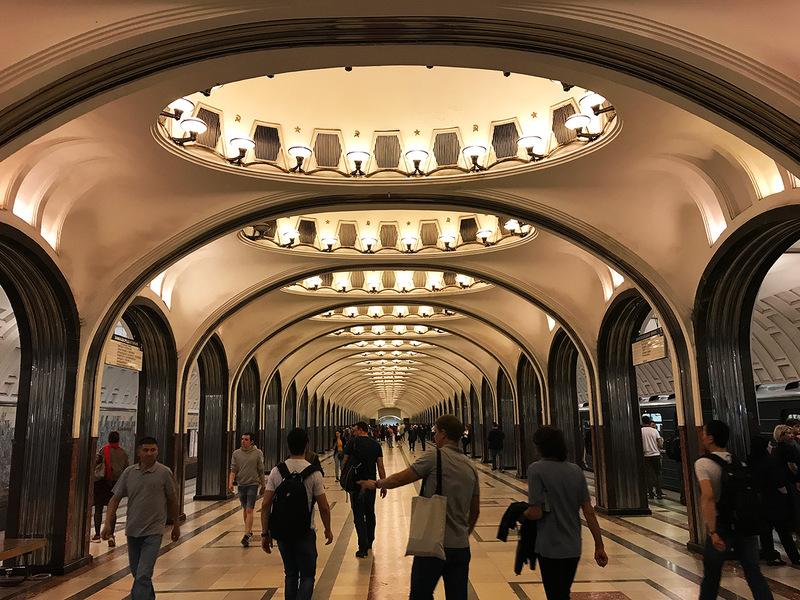 The Mayakovskaya metro station is the most beautiful metro station I have ever seen. The station was named after the Russian Futurist poet Vladimir Mayakovsky. It was openend to the public on September 11, 1938 and was used as a command post for Moscow’s anti-aircraft regiment during WW2. 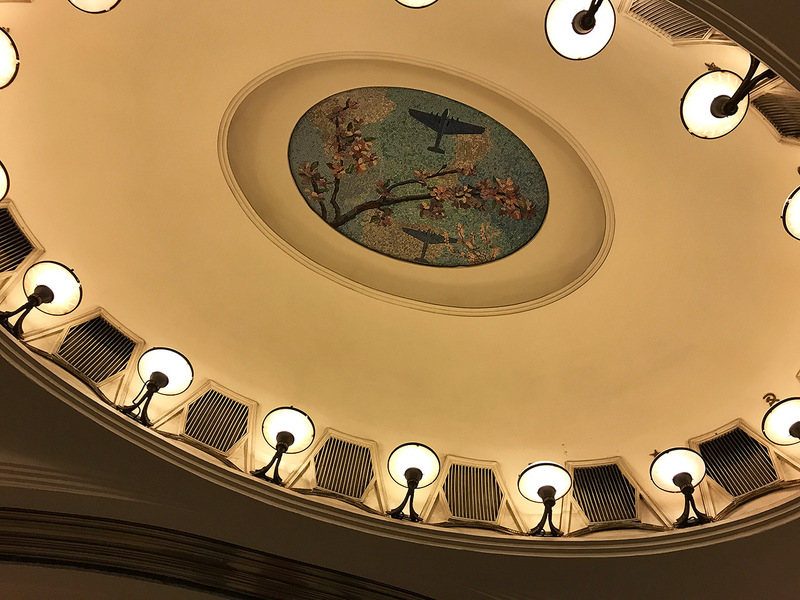 The Mayakovskaya station is world renowned for its beautiful design and the amazing ceiling mosaics depicting “24-Hour Soviet Sky”. Alright, enough of the sightseeing. After a short walk through a park we finally arrived at the venue. The weather was fantastic, it felt absolutely Mediterranean! The Russian Paneristis have an amazing club room that is located in a restaurant named Andy’s Friends. Check out the signage! That’s right, Piazza San Giovanni is the square in Florence where the Orologeria Svizzera was located. 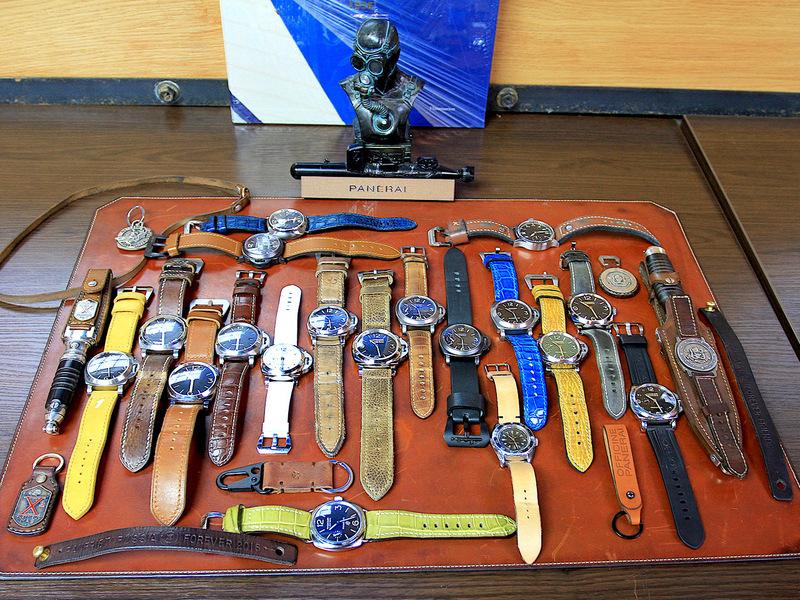 The room is clearly inspired by the Panerai Boutique in Florence. 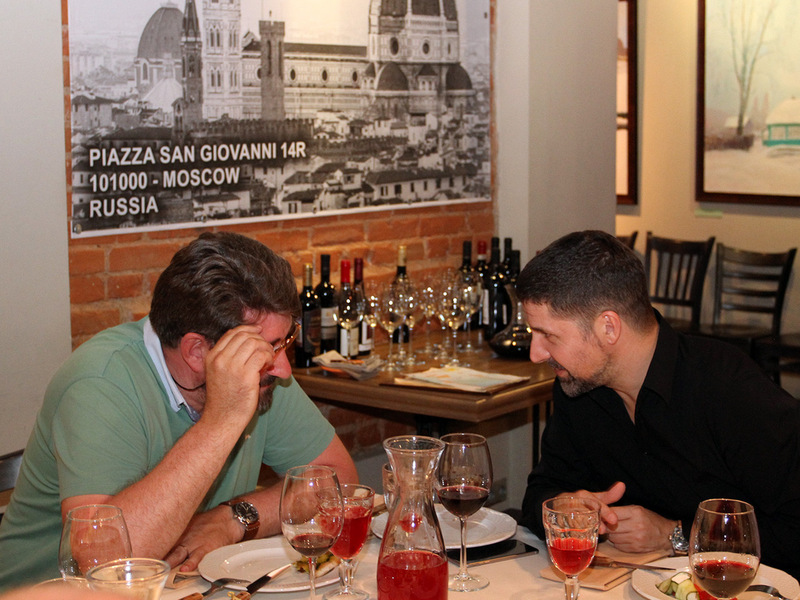 Andrey, the restaurant owner, is a Paneristi himself. 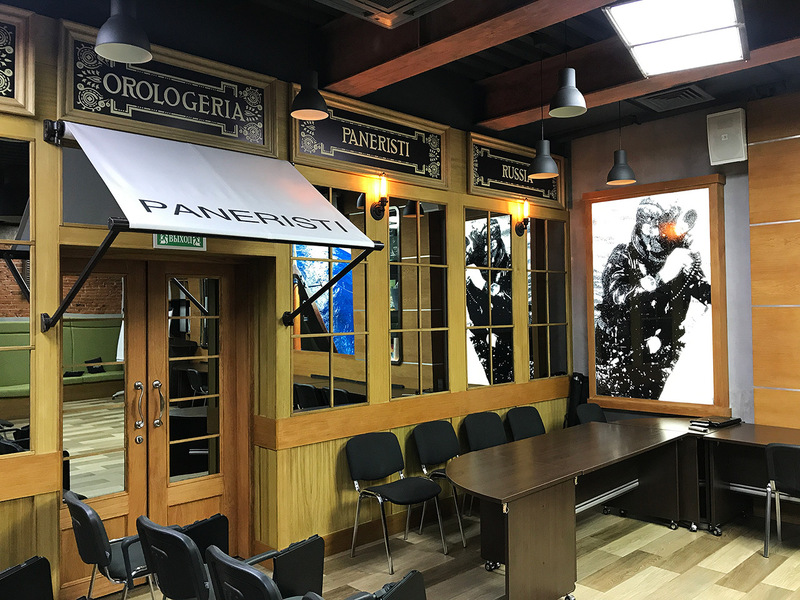 The story goes that Andrey decided to create his own boutique after a not so pleasant experience with the Russian Panerai boutique. 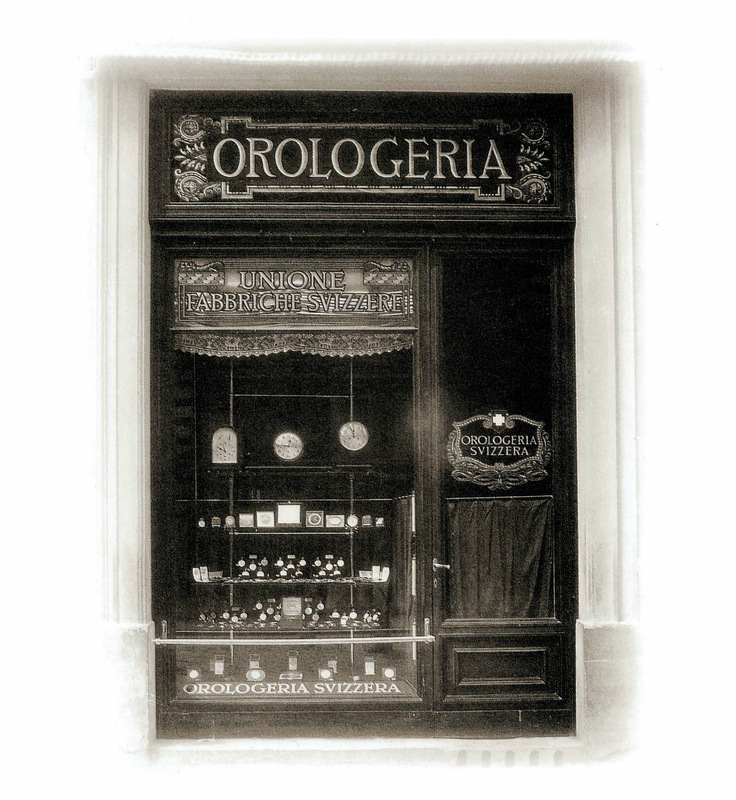 To compare, the original Orologeria Svizzera in the late 1920s. 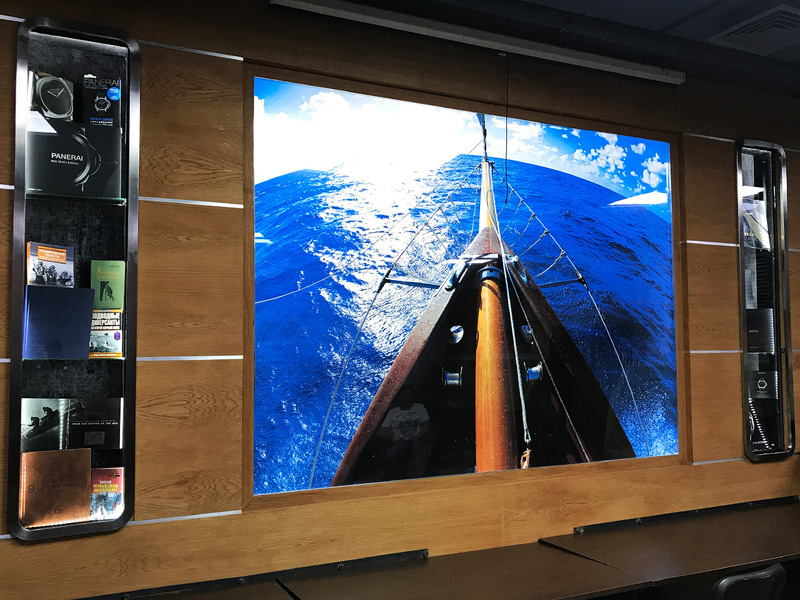 The front of the room is dominated by a picture of the famous Panerai yacht Eilean at sea. The yacht had an appearance in Duran Duran’s video from 1982 for their song “Rio”. On the left and right are displays with Panerai books and interesting literature about russian frogmen. Speaking of Russian frogmen. 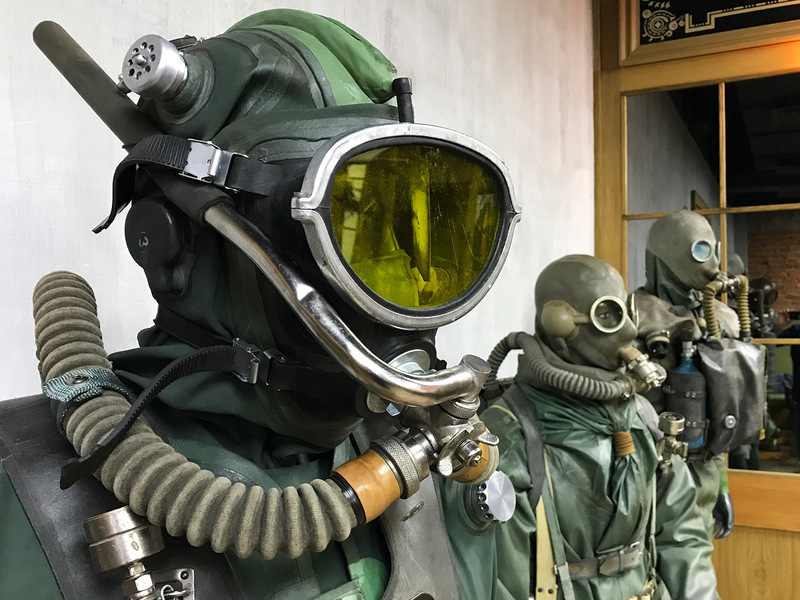 To my total surprise, the club room was also filled with historical Russian diving suits and equipment from different time periods. These were provided by Dmitry Polukhin. 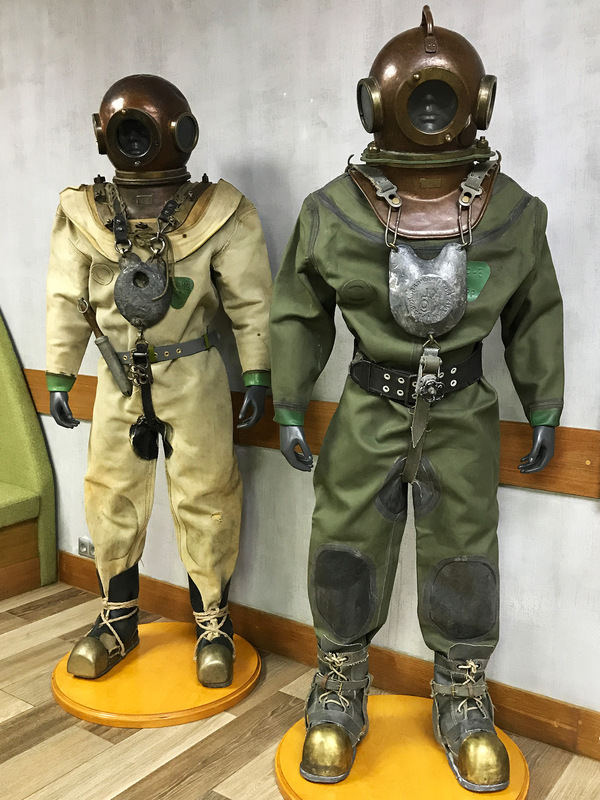 There are for instance two classic Russian standard diving dresses. 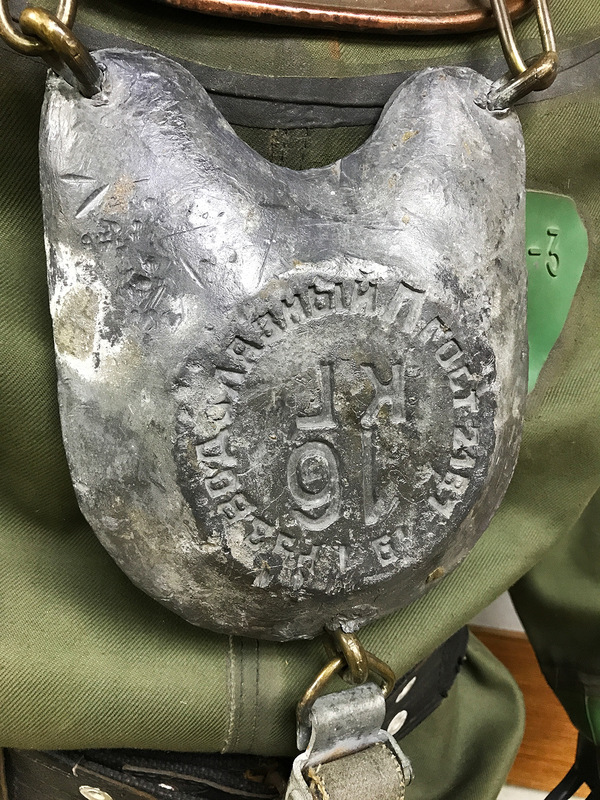 Massive chest weight to keep the buoyant helmet down when working underwater. 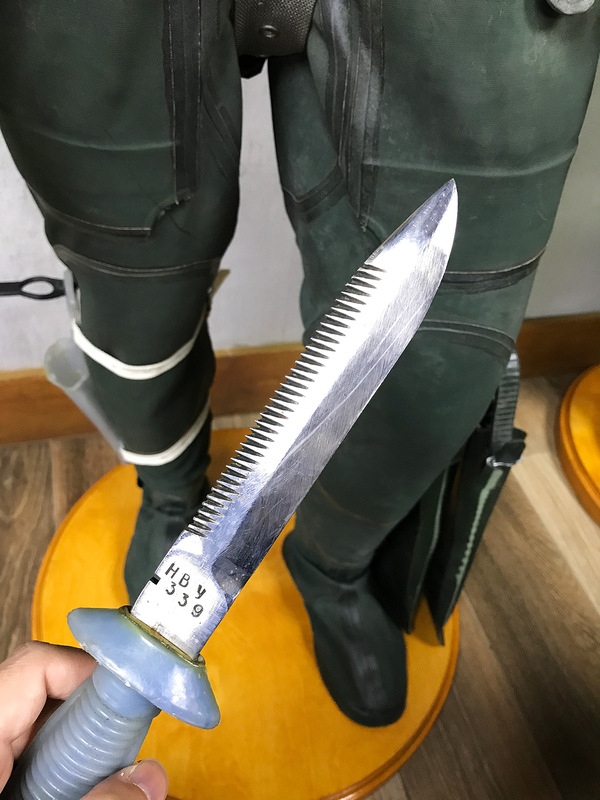 Screw-in knife (Italian Galeazzi style). 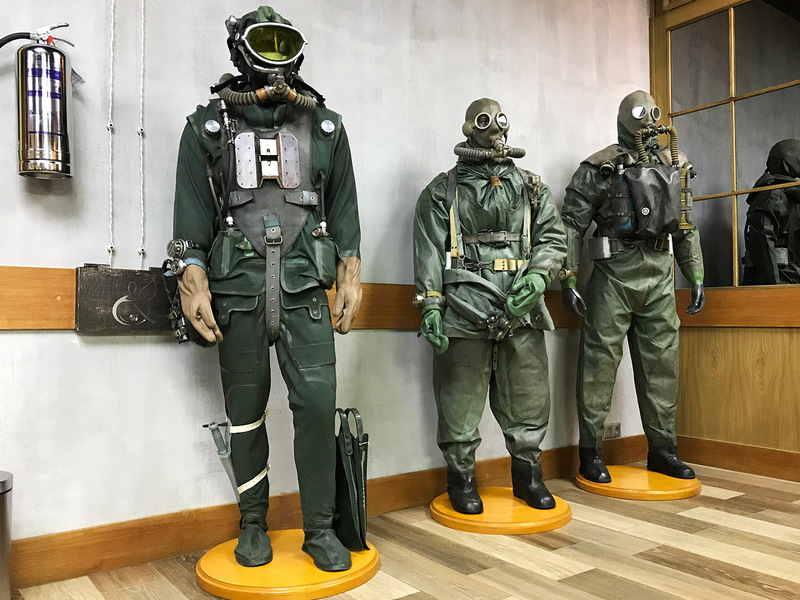 There is the also more recent diving equipment like these Russian commando frogmen diving suits with military grade rebreathers and various instruments. 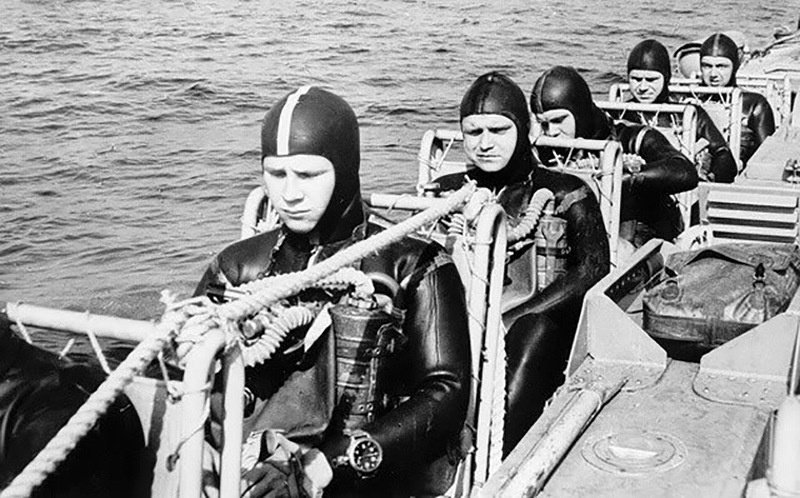 I was surprised to learn that Russian frogmen (Morskoy Spetsnazovets = Naval Special Forces) performed over 200 mission during WW2. In September 1943, Russian frogmen destroyed a bunch of Decima MAS boats in the German Naval Base of Strelna near Leningrad. Apparently, the Russian frogmen had also underwater encounters with German Kampfschwimmers. This stuff is uber cool, isn’t it? 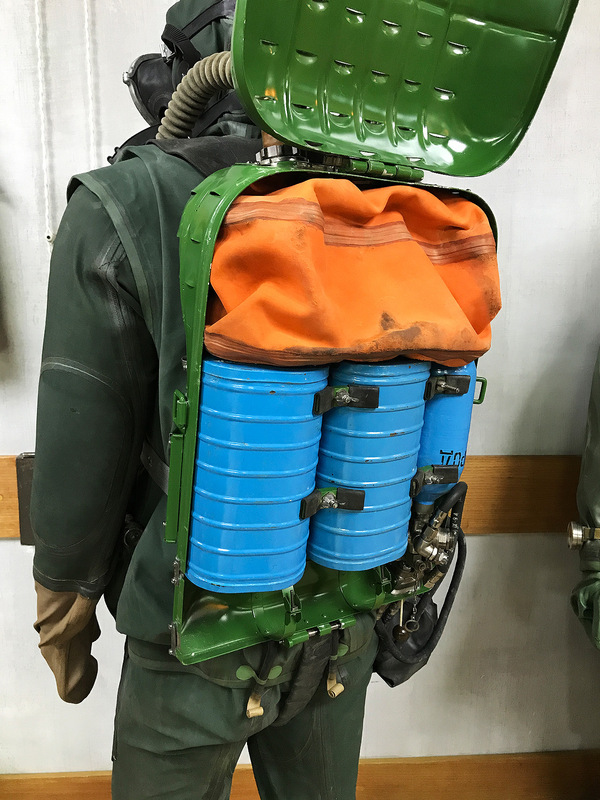 Commando frogmen use closed circuit oxygen rebreathers that operate without creating bubbles. This is very important in order to remain undetected. 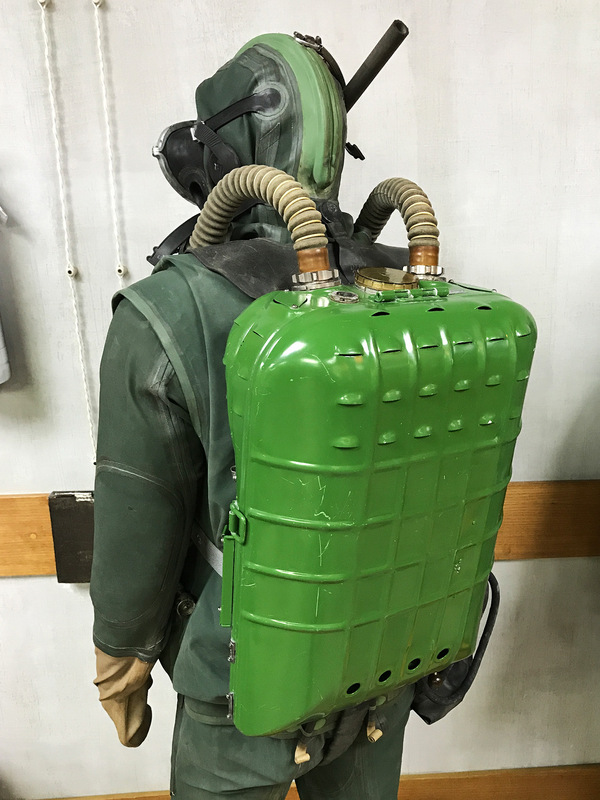 The inhaled oxygen is recylcled and cleaned when passing through the scubber, a canister filled with a carbon dioxide absorbent such as soda lime. This specific device is an IDA-71. 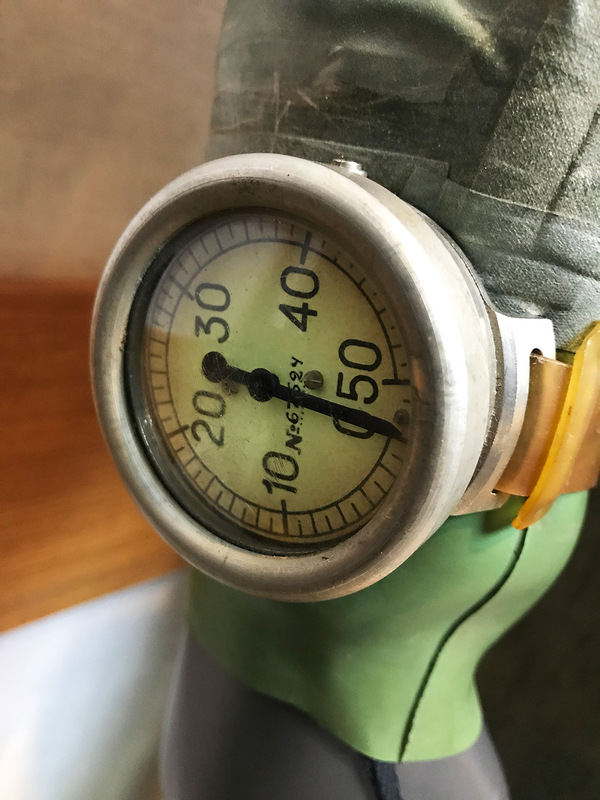 The IDA-71 was a standard Russian frogman’s and naval work diver’s breathing set for many years. 71 probably refers to the year it was developed. 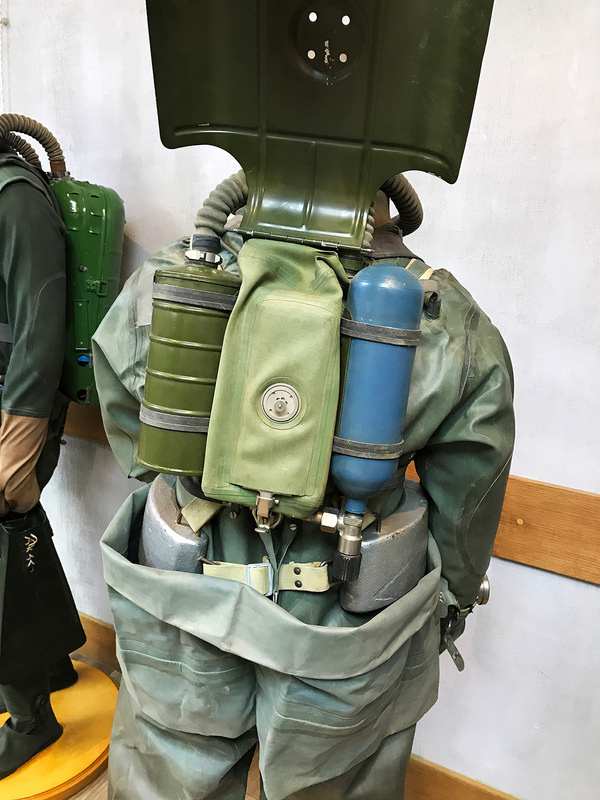 The backpack consists of a counterlung (orange bag), two scrubber canisters, an oxygen supply cylinder and the regulator. The empty space at the bottom can be filled with more oxygen if required. Russian divers were equipped with all kinds of instruments. 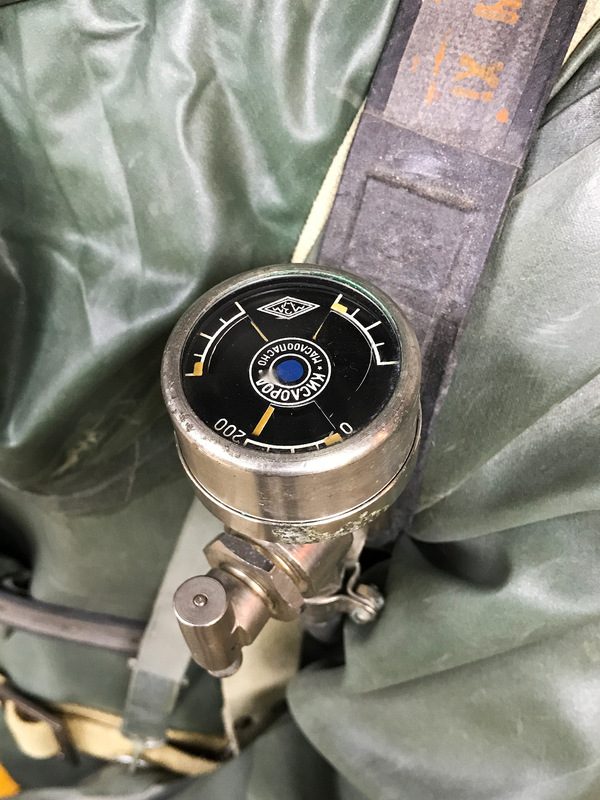 Diving Compass and depth gauge. 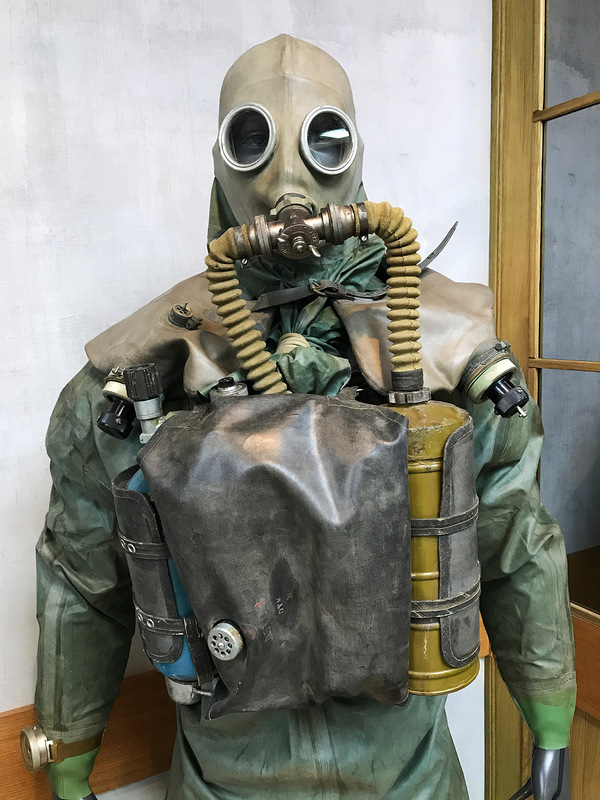 IDA-57 rebreather, probably from 1957. 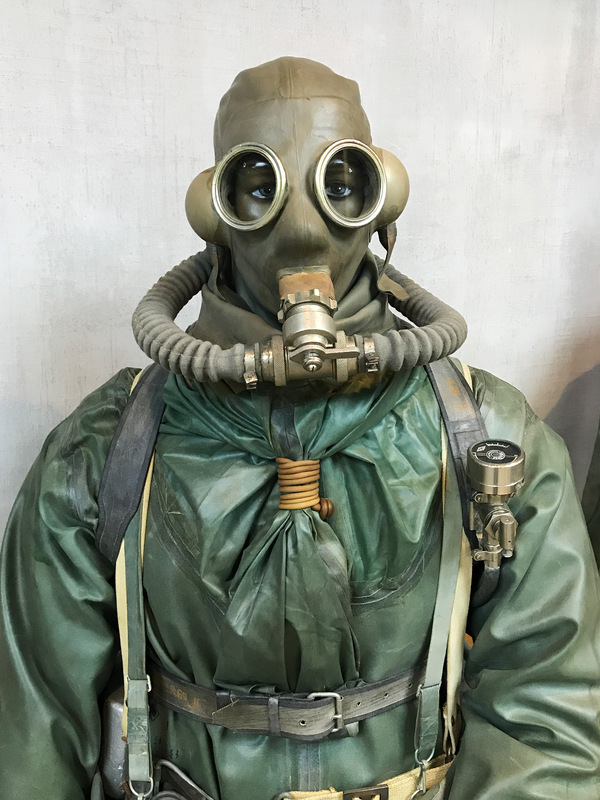 The mouth piece can be switched between rebreather and breathing normal air on the surface. Scrubber canister, counterlung and oxygen cylinder. What was clearly missing here was the legendary Russian diving watch “Zlatoust”. 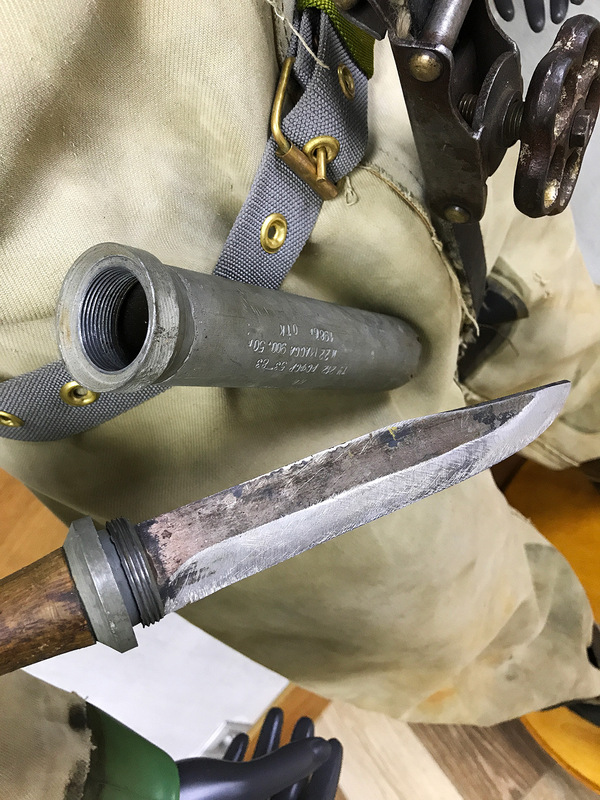 The Zlatoust 191 ChS is a beast. 60mm in diameter, same as the Panerai GPF 2/56. The actual crown is protected underneath a waterproof crown cover. 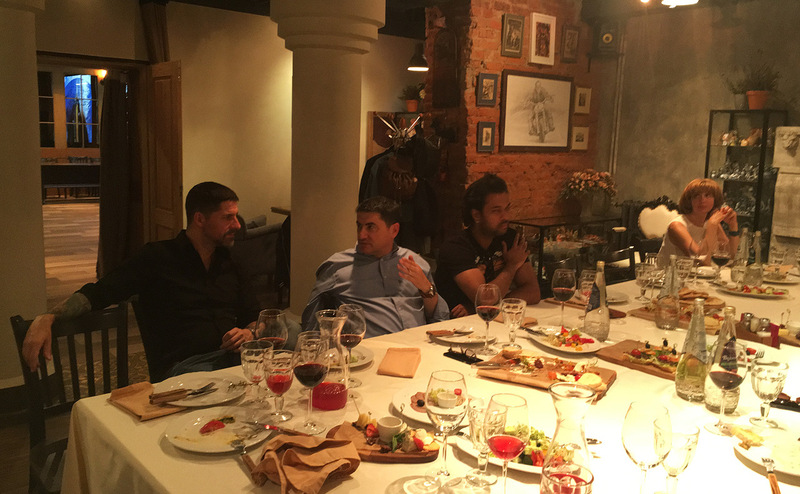 The dinner took place in a back room of the Paneristi club room. The food was delicious and the atmosphere great and very relaxed. 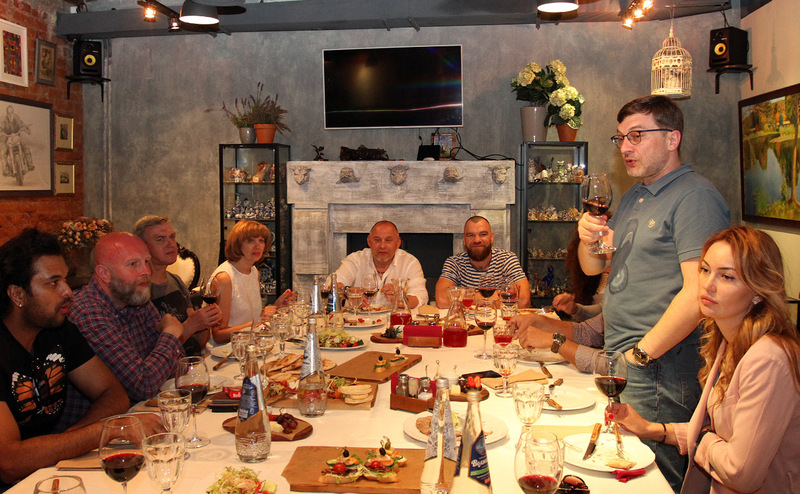 Konstantin holding a great welcome speech for the international guests. International guests came from India, Turkey and Malaysia. Sergio and I having a great conversation about the secrets of vintage Panerai. 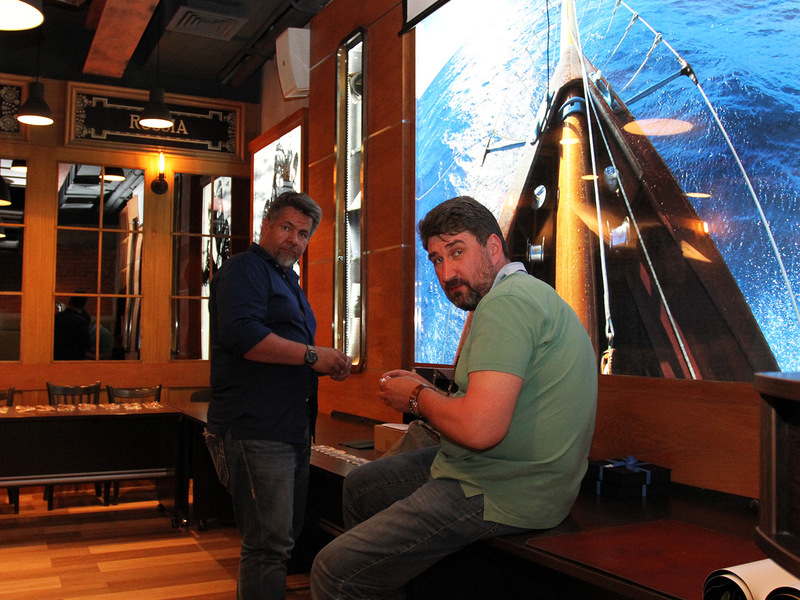 Anton and Sergio preparing the lucky draw. 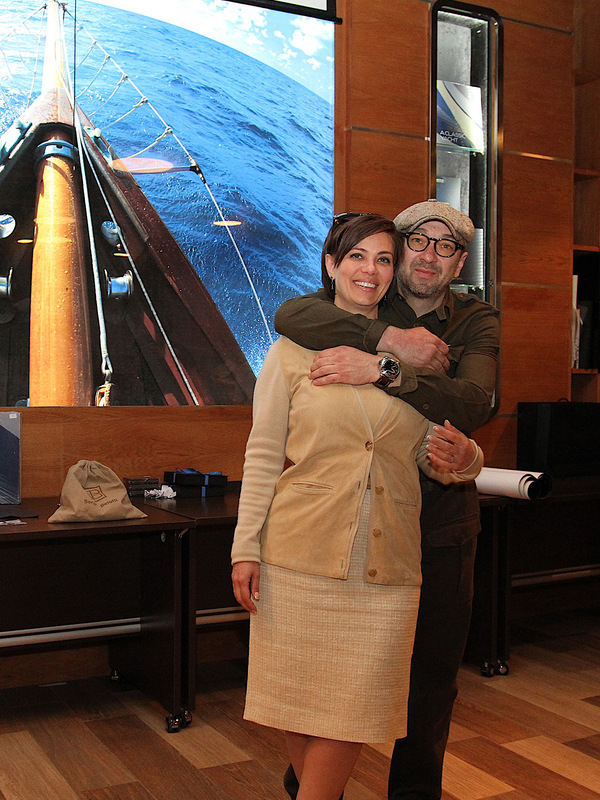 Andrey and his lovely wife. I was lucky and won this amazing commemorative buckle made of steel, titanium, enamel, with heat blued screws, by Max Bashlay. Limited edition of 13 pieces. Yay! Group shot at the end of the evening. And finally the table shot. 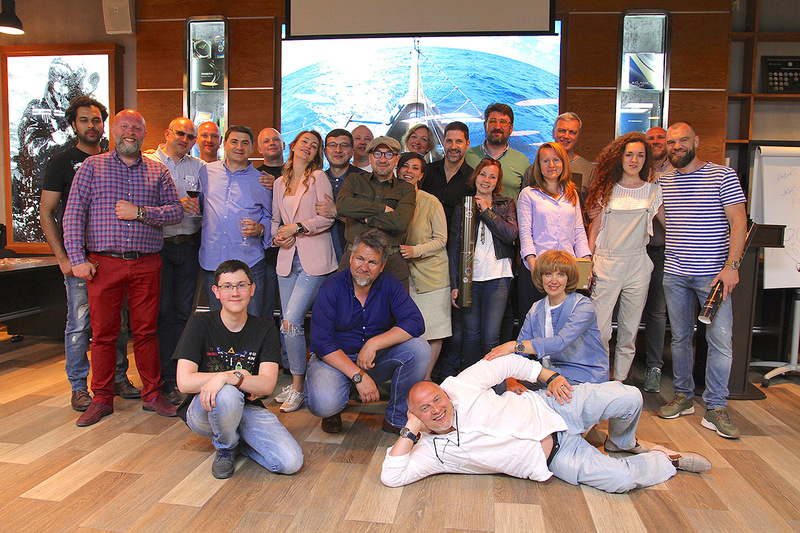 The Russian Paneristi got their own Panerai Special Edition in 2014, the PAM 622. Can you spot it? The next day was all about sighseeing. Anton picked me up at the hotel and we walked to the Kremlin. 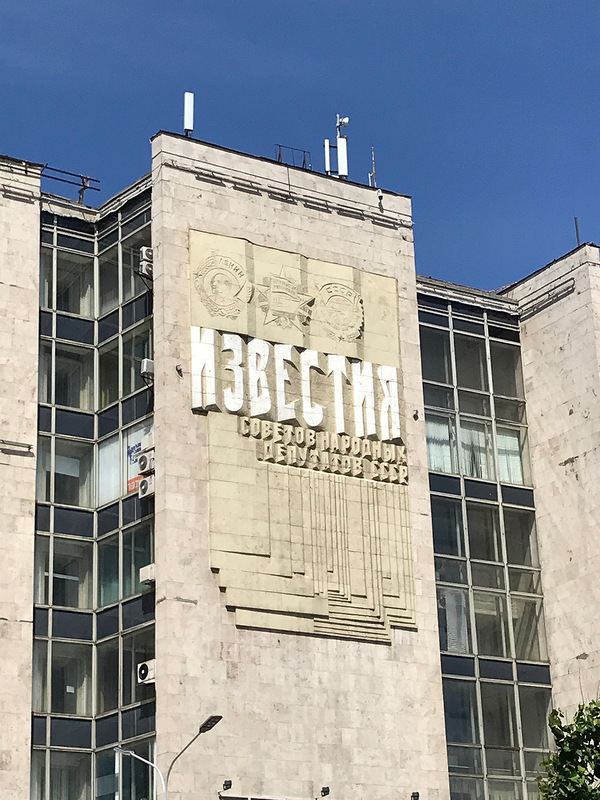 Soviet symbols are still omnipresent in Moscow. This used to be a major newspaper during the Soviet era. Arrived at the Manezhnaya Square near the Kremlin. The structure in the front is the famous world clock fountain. 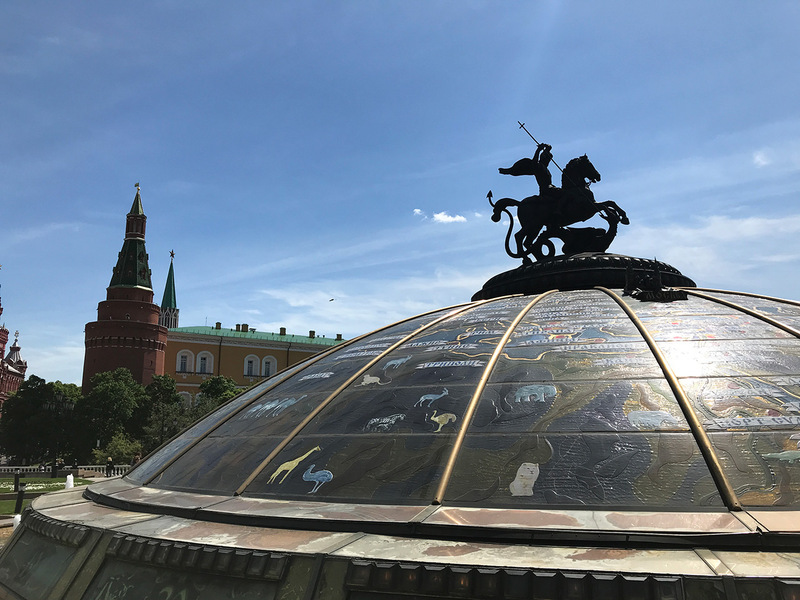 The sculture on top of the fountain depicts Saint George slaying the dragon. 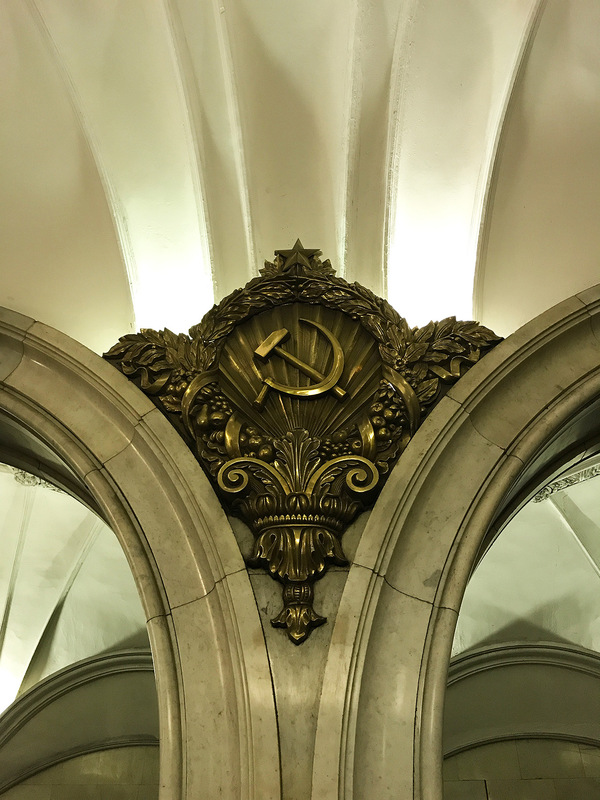 This symbold is the heralding emblem of Moscow. 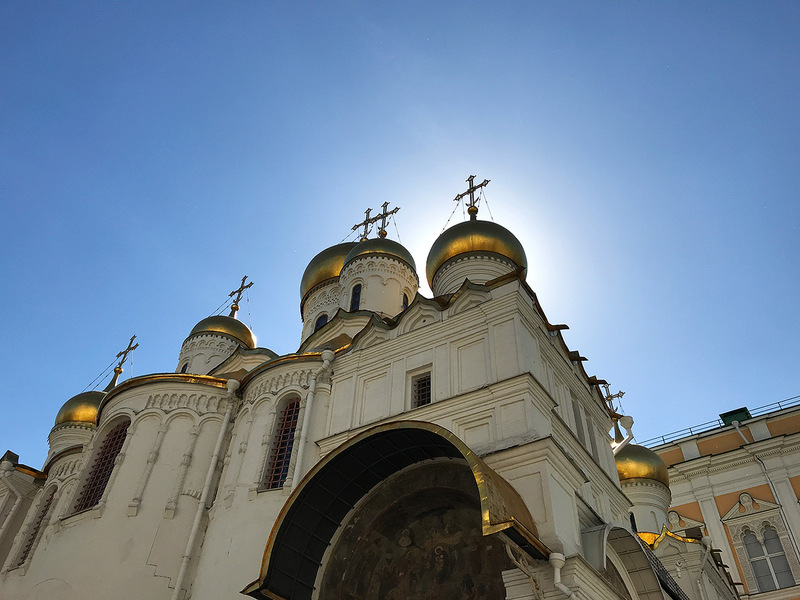 The Cathedral of the Annunciation within the Kremlin complex. 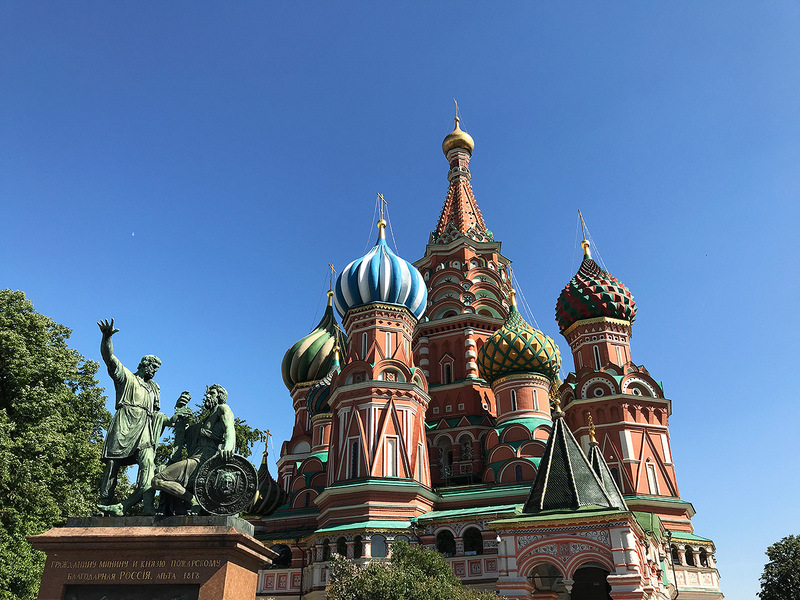 The famous Saint Basil’s Cathedral in Red Square. 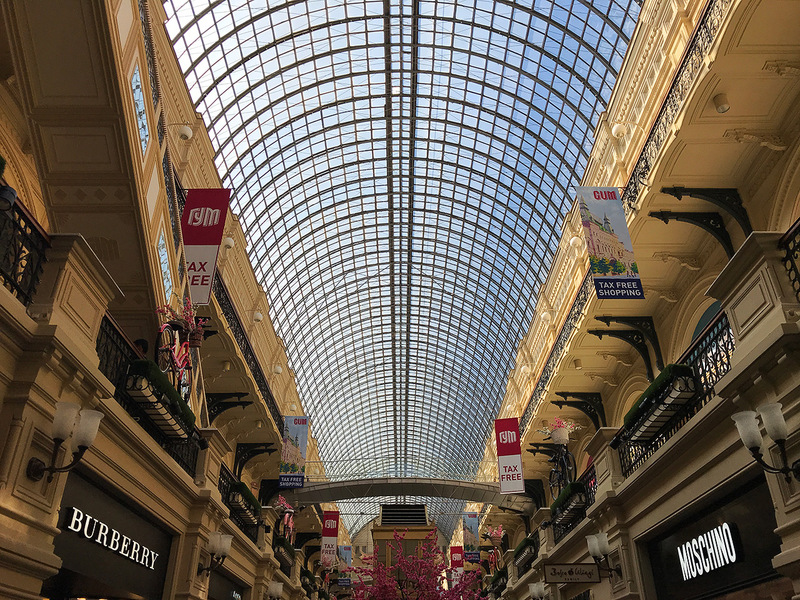 The beautiful GUM shopping mall right next to Red Square. The structure was built in the late 19th century. The glas roof is simply amazing. 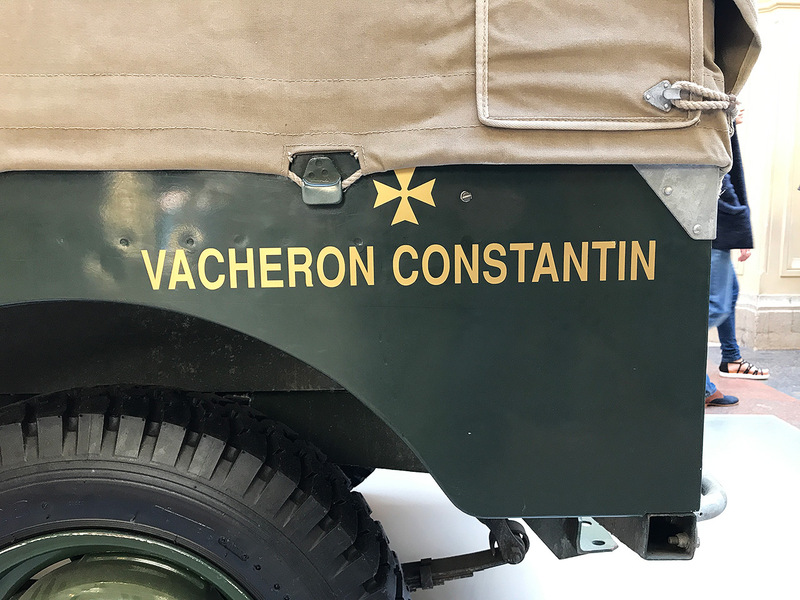 Vacheron Constantin branded Land Rover Series 1. 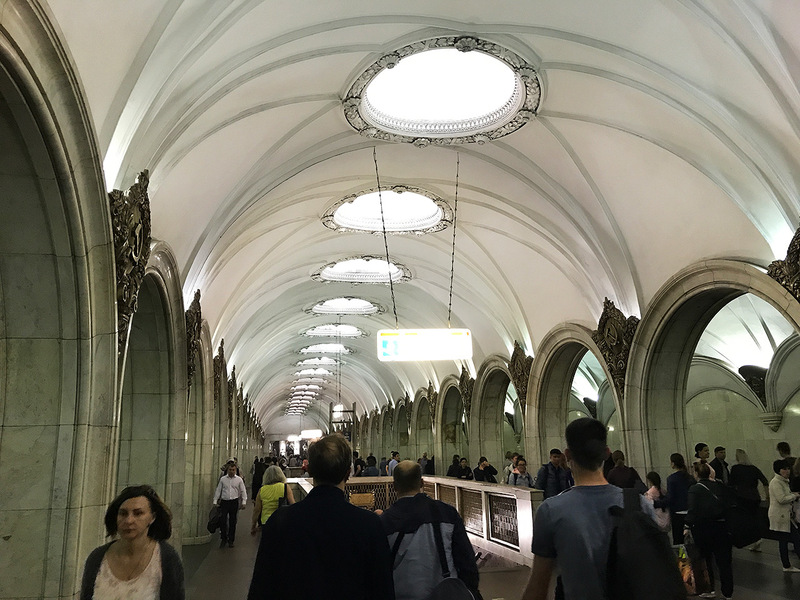 Ploshchad Revolyutsii, another beautiful metro station in Moscow. The station is named after Revolution Square, under which it is located. Each arc is flanked by a pair of bronze sculptures depicting the people of the Soviet Union. The next picture shows Maxim (Sergio’s son), Sergio and Rifat rubbing the dog’s nose for good luck. Late lunch in great company at Andy’s Friends. 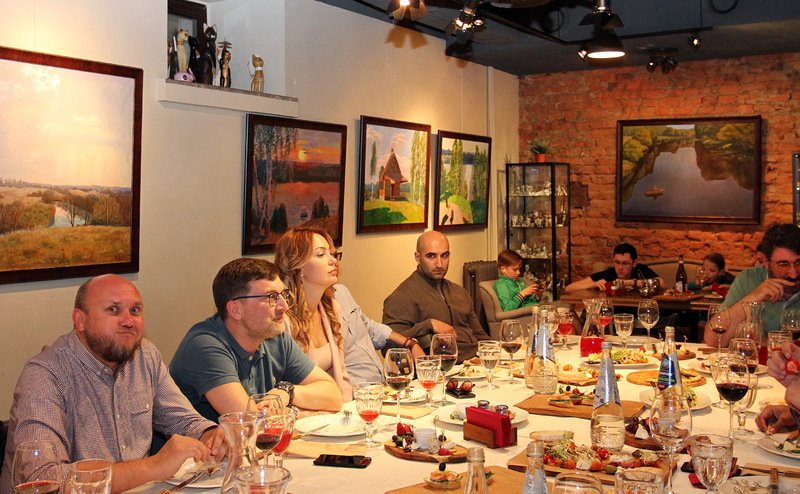 We had Borsch, a traditional local beetroot sour soup accompanied by a nice bottle of Prosecco. Yummie! 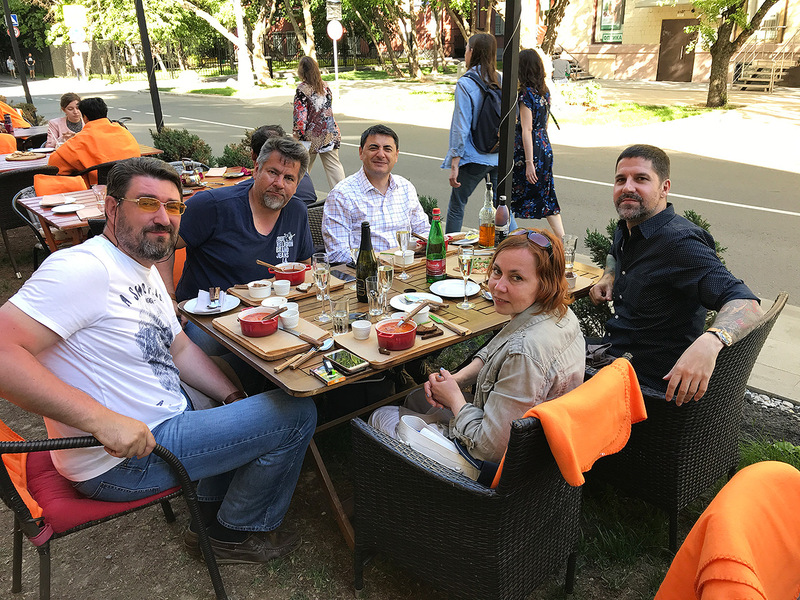 After two fantastic days in Moscow, it was time to say goodbye. 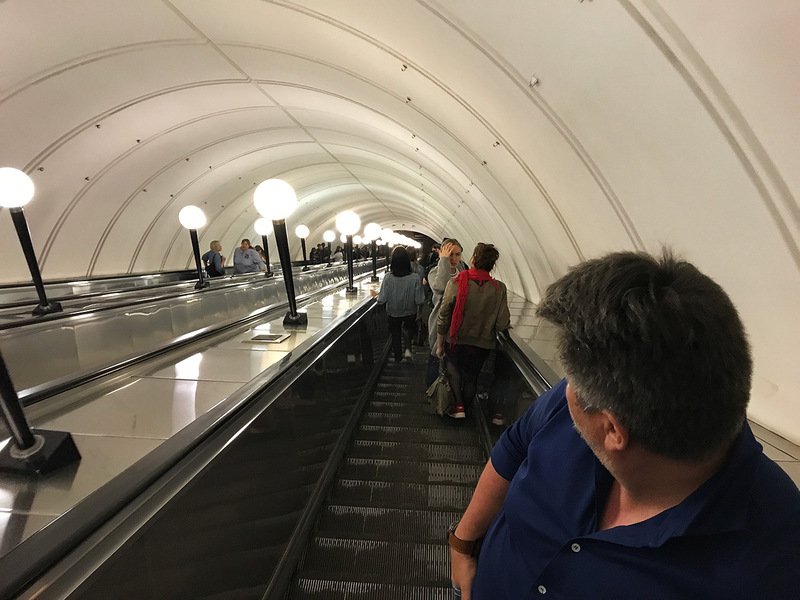 In order to enjoy Moscow a little bit longer, I decided to use public transporation to get to airport. 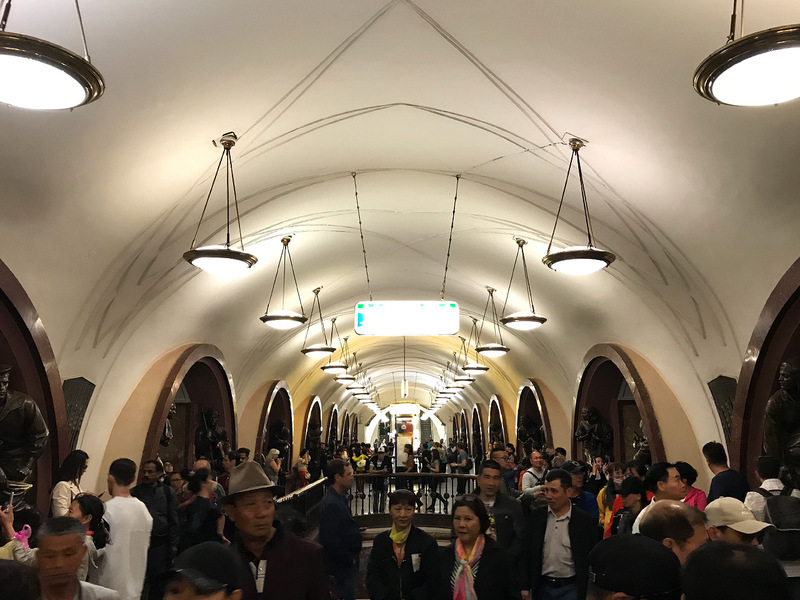 This is the Paveletskaya metro station, another beautiful underground “cathedral”. Hammer and sickle are an important part of the history of this amazing country. I am glad these symbols are still around. 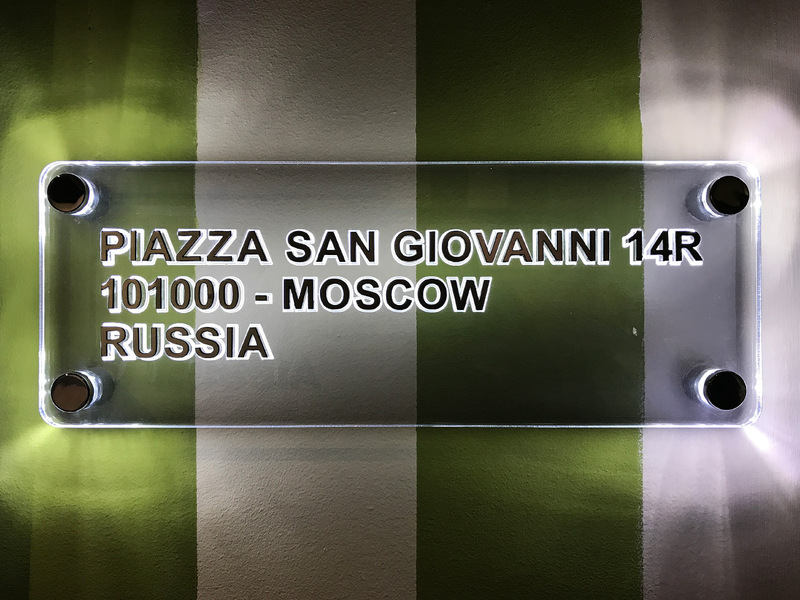 Thank you for your hospitality Russian Paneristis. 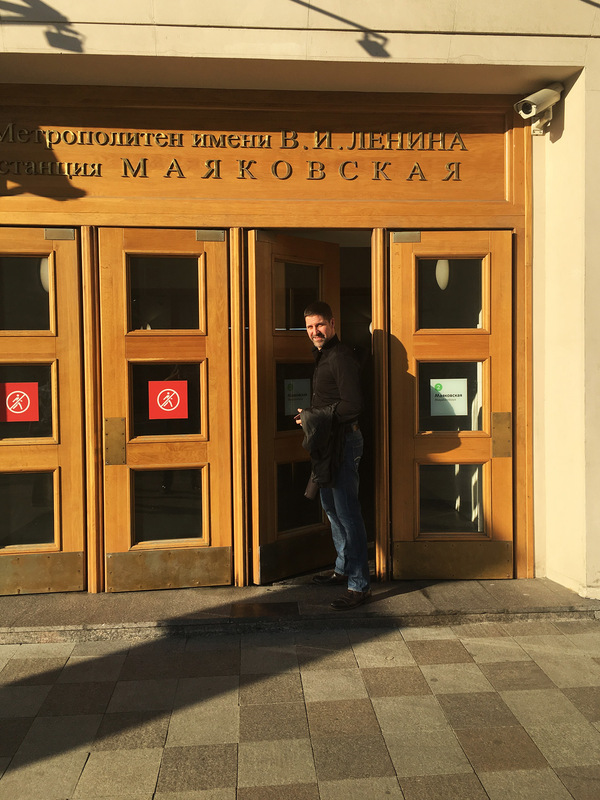 Moscow was an amazing experience! I had a great time and will definitely be back. 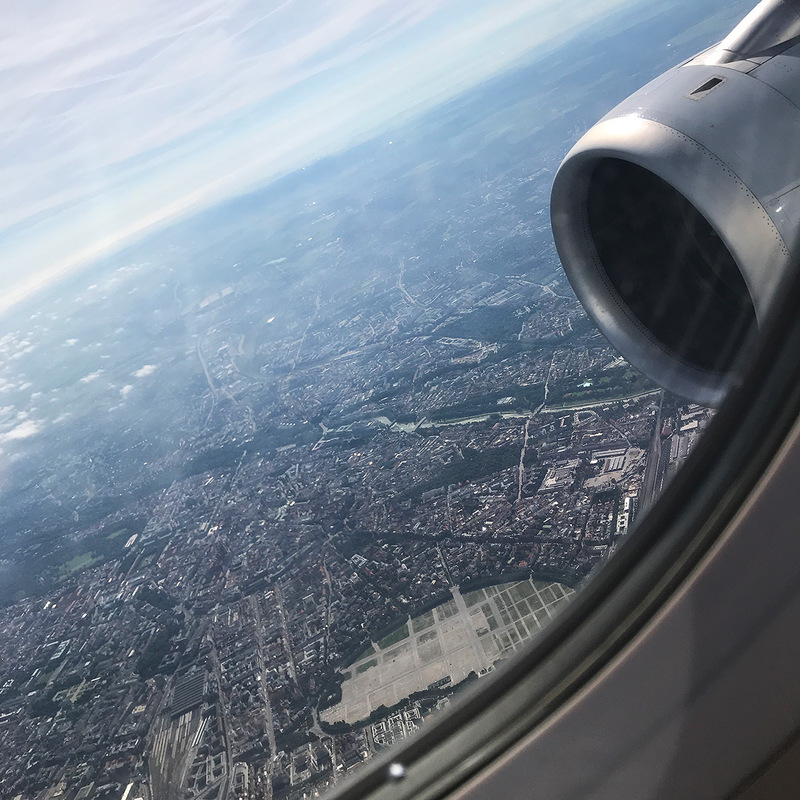 I flew back to Barcelona where I spent another few days with my family. After that, I went to London where I had the opportunity to strap this to my wrist. 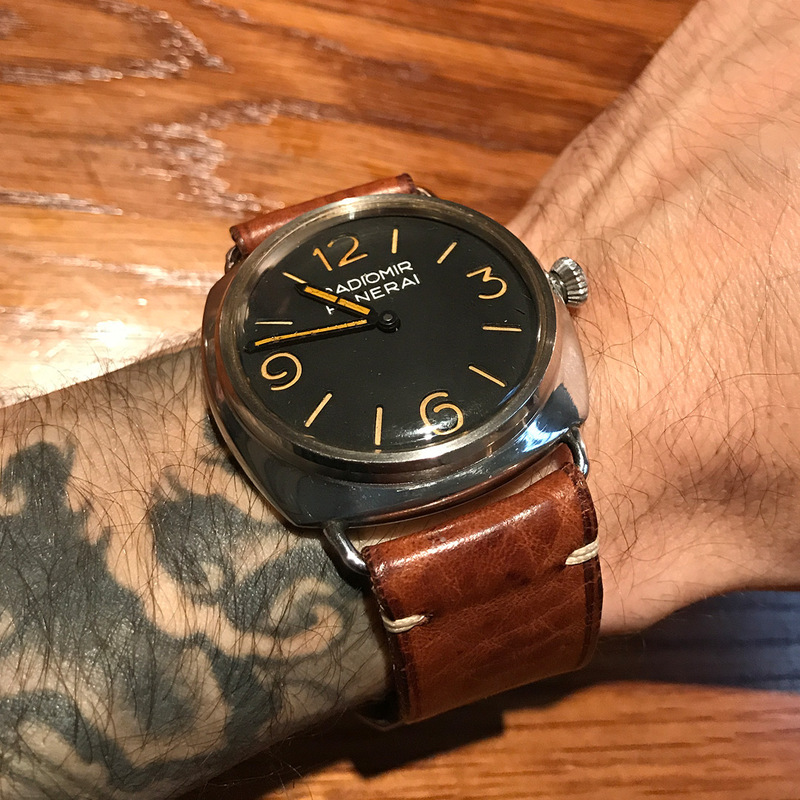 The famous Panerai 3646 with Xa FLOTMAS No. 048 engravings on the caseback. This is an ongoing restoration project. 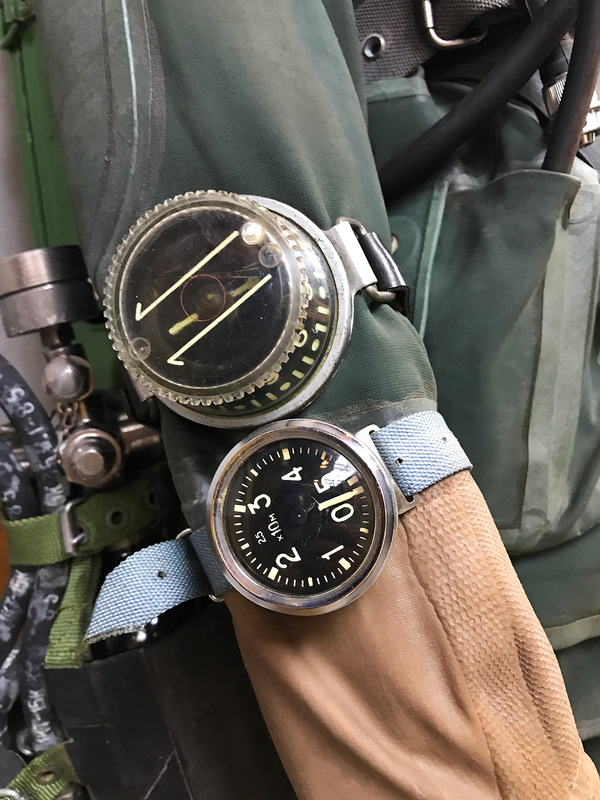 This watch will soon receive a period-correct riveted plastic dial to replace the altered Kampfschwimmer dial. Stay tuned! -Please cite this claim. I am fascinated by all maritime special operations. In “Underwater Warriors,” Paul Kemp claims that the Soviets never resorted to this form of warfare in WWII. 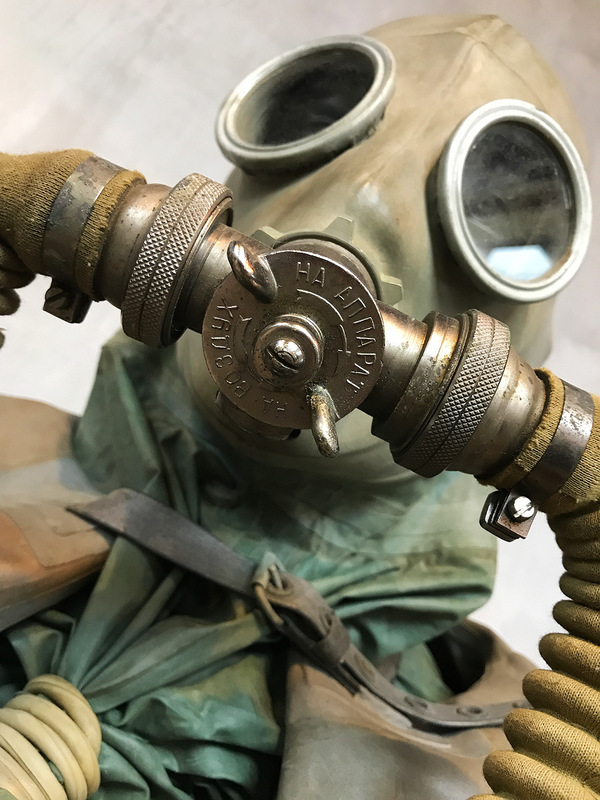 For more information on Soviet frogman exploits, the article “Stranger than fiction” by Gordon McCormick is worth a look. I love your website! Keep it up!